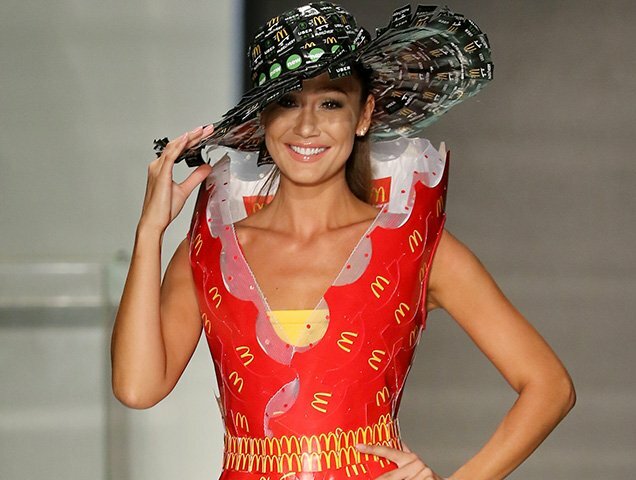 Last Thursday, global greasy spoon McDonald’s debuted its very own couture line. Yes, you read that correctly. A marketing genius/South Florida franchise owner challenged students at the Miami International University of Art and Design to create runway-worthy pieces using only McDonald’s packaging. The resulting collection, dubbed McDCouture, walked the runway during Miami Swim Week. Still, there was a silver lining to all the cardboard usage. The student with the most innovative design, Pablo Machado Palomeque, received a $5,000 scholarship care of the Cabrera/Bentancourt organization, which owns 20 golden-arched restaurants in the area and sponsored a similar Miami International University-wide competition in 2015. Palomeque’s look borrowed from two American megabrands. His “McDCouture Angel” featured a whopping 7,000 butterflies made from 1,100 sandwich wrappers. 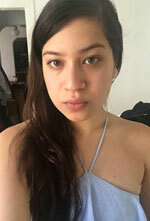 Five years later, for Fall 2014, Jeremy Scott released a McDonald’s-inspired capsule collection featuring Happy Meal box-shaped chain-strap bags, an iPhone case that looked like a large order of fries and various ketchup- and mustard-hued pieces emblazoned with a near-copyright-infringing letter “M.” Fashion girls ate it up. We imagine Mickey D’s appreciated the free advertising.